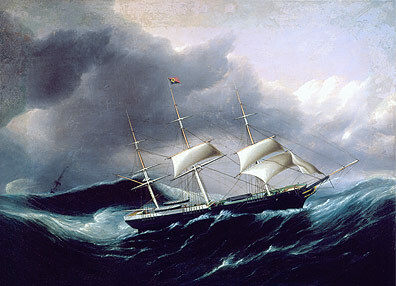 Buttersworth shows her sailing in a gale, normal weather for the winter North Atlantic. She is carrying a snug, well-reefed main and fore topsails, a reefed foresail and inner jib. The jib has broken free or is being reset. Buttersworth also misspelled her name. The long cabin filling the space between main and mizzen masts, common in the North Atlantic trade, provides plenty of space for passengers who could afford it.